As part of our World War I commemoration, we recently invited the public to help transcribe written accounts of World War I soldiers and their first experiences in battles. This series contains remarkable and moving accounts of war through unit histories, station lists, operations reports, messages, and more. Of the 2,409 records in the series, 6,652 pages were transcribed by our citizen volunteers. We were especially moved by the descriptions of the battlefield by the soldiers who experienced the war first hand, and wanted to find a way to capture their experiences. Now that the transcriptions are nearly complete, we are excited to share how this work transcribing has unlocked the stories within these records, and ensured these soldier’s voices are heard. Click on the magnifying glass or press “enter” on your keyboard to start your search. See your results! Give it a try, and let us know what you find within these records! You could try searching for “trench,” or “Verdun,” or even “pigeon.” Have you discovered something interesting or unexpected? How else could you use this feature in you research? There are a few more records in this series that can still be transcribed! Help us finish up these last few records to make these stirring accounts fully accessible. Get Started Transcribing! You did it! During last week’s Citizen Archivist Week of Service, more than 430 citizen archivists helped tag and transcribe more than 3,500 pages! Thanks to all of you for helping us reach (and surpass) our goal. Didn’t get a chance to participate last week? Not to worry. Our Citizen Archivist Dashboard is updated regularly with new missions and featured records to tag and transcribe. Check back often to see what’s new, and keep up the great work! At the National Archives, we are committed to making the citizen archivist program a great experience for our virtual volunteers. 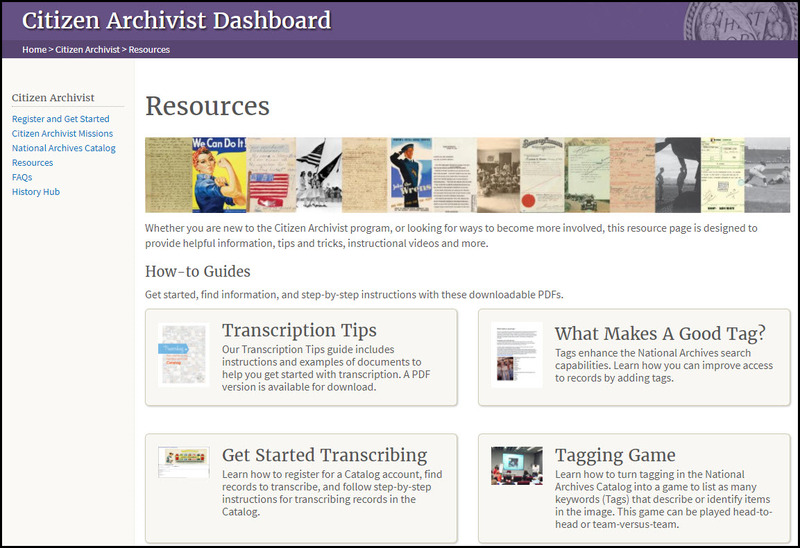 That’s why today we are introducing our new Resources page on our Citizen Archivist Dashboard. Whether you are a new transcriber, or looking for ways to become more involved, our resource page is designed to provide helpful information, tips and tricks, instructional videos and more. We created this resource page based on feedback and frequently asked questions we receive from our citizen archivists, and we hope you find it useful. Looking for some transcription work to do? We have a group of really easy records to transcribe and we'd love your help. Help us transcribe index cards of Naturalization Records. These index cards have just a few lines of text on them and they are addictive - we bet you can't do just one. New to Transcription for the National Archives? Learn how to get started. Get started transcribing Indexes to Naturalization Records. This blog post is an excerpt from the National Archives Catalog Newsletter. If you'd like to receive the newsletter - please subscribe. Last week we celebrated Public Service Recognition Week with our annual Archivist’s Achievement Awards ceremony. This event provides the opportunity to recognize volunteers and staff of the National Archives for their passion and dedication to serving the mission of the National Archives and the American people. This year, we were proud to present a special award to one of our most dedicated and enthusiastic Citizen Archivists: Alex Smith. 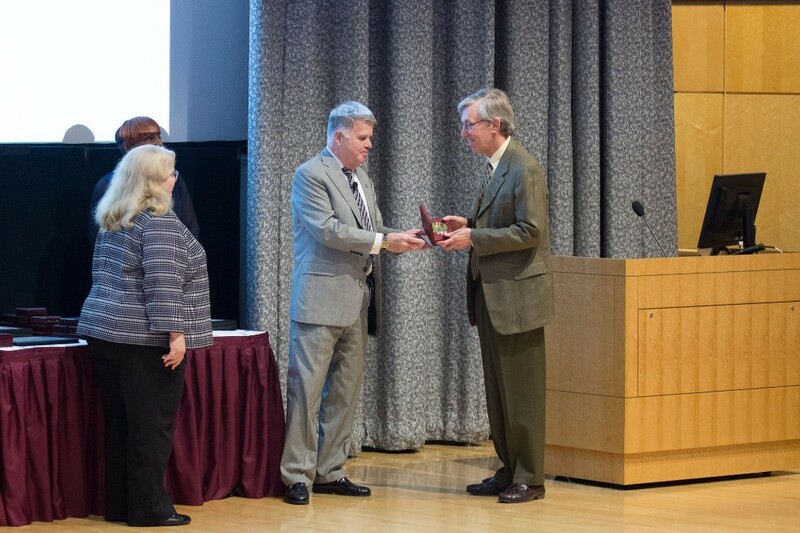 Archivist of the United States, David Ferriero (center), presents Alex Smith (right) with the Citizen Archivist Award at the 2017 Archivist’s Achievement Awards Ceremony. Photo by Jeff Reed. 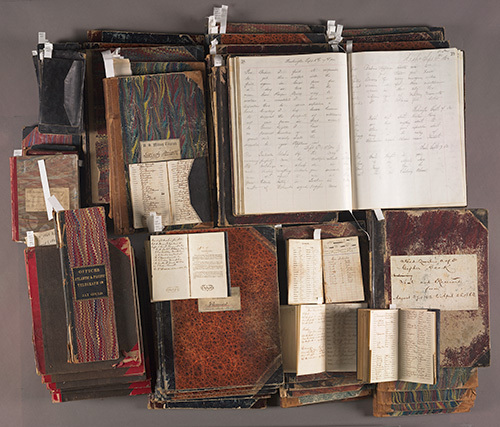 In the first eighteen months of his virtual volunteer work, Mr. Smith made a remarkable 11,100+ transcription contributions to the National Archives Catalog. Several times a week he logs into the Catalog and searches for his next record to transcribe. He often employs a serendipitous method to find the next record. For example, while searching for and transcribing telegrams, he reads about prohibition agents that leads him to search for prohibition. He’s inspired by the books he reads in his leisure – searching for public figures in the catalog such as Sherman Adams, John Bricker, Meade Alcorn, and Ann Whitman. Alex Smith is not only a diligent citizen archivist and transcriber, he also is an evangelist and cheerleader for records in the National Archives, sharing the stories he’s found with friends. He is full of excitement when he discovers the intriguing, heroic and even the mundane within our records – he finds “happy surprises” within routine and seemingly dry records. Always a storyteller, he recounts what he has discovered while transcribing and has inspired others to become citizen archivists as well. We were thrilled to welcome Alex to the National Archives and present him with this year’s Citizen Archivist award. We even got to spend some time showing him around the National Archives at College Park and talking about our favorite records. National Archives Catalog Community Managers Suzanne Isaacs (left) and Meredith Doviak (right) with Alex Smith. 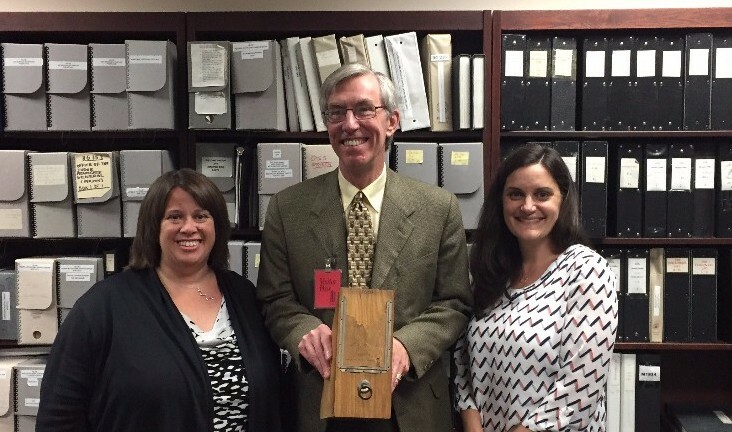 Mr. Smith is holding a 19th century example of a wooden box used for the storage of records. We consider ourselves the lucky ones to have such dedicated volunteers. Will you join us as a Citizen Archivist? In commemoration of the 75th anniversary of the attack on Pearl Harbor, we invite you to tag selected records and photographs in the National Archives Catalog related to the attack on Pearl Harbor, Hawaii, on December 7, 1941. The records in this mission include photographs of the attack, the aftermath, the USS Arizona memorial, and ceremonies. Tagging details found in the photographs such as names, locations, types or names of planes and ships, or other details not found in the title or caption, will help make this content more discoverable in the Catalog. New to Tagging? Learn how to get started. You can register for an account in the National Archives Catalog and begin tagging right away. Looking for more? Browse more tagging missions from the National Archives. Select a mission that interests you and get tagging. 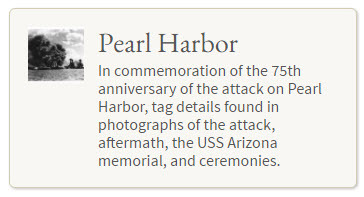 Learn more about Pearl Harbor and the 75th Anniversary from the National Archives. Help us transcribe the millions of digitized pages of records in the National Archives Catalog. Transcription helps us improve search results and increase accessibility to our historical records. New to transcribing? Our newly designed Transcription Tips webpage shows you how to get started with transcription, and includes some helpful examples of documents so you can see transcription in action. Teachers can download and print a PDF version for use in their classrooms. 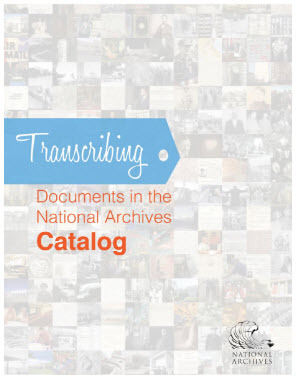 By transcribing, you are helping unlock history and discover hidden details of records and the stories they contain. Check out our transcription missions! We’ve curated groups of records on particular subjects to help you get started transcribing. Take a look at our missions page to start transcribing documents related to exploring space, African American history, and more! If this is your first time participating - read the Transcription Tips and begin with the getting started instructions. Here's your chance to help de-code secret telegrams sent during the Civil War. With support from the NHPRC, the Huntington Library, Art Collections, and Botanical Gardens has launched of an innovative crowdsourcing project to transcribe and decipher a collection of nearly 16,000 Civil War telegrams between Abraham Lincoln, his Cabinet, and officers of the Union Army. Roughly one-third of the messages were written in code. The “Decoding the Civil War” project is a partnership among Zooniverse (the largest online platform for collaborative volunteer research), North Carolina State University’s Digital History and Pedagogy Project, and the Abraham Lincoln Presidential Library and Museum. 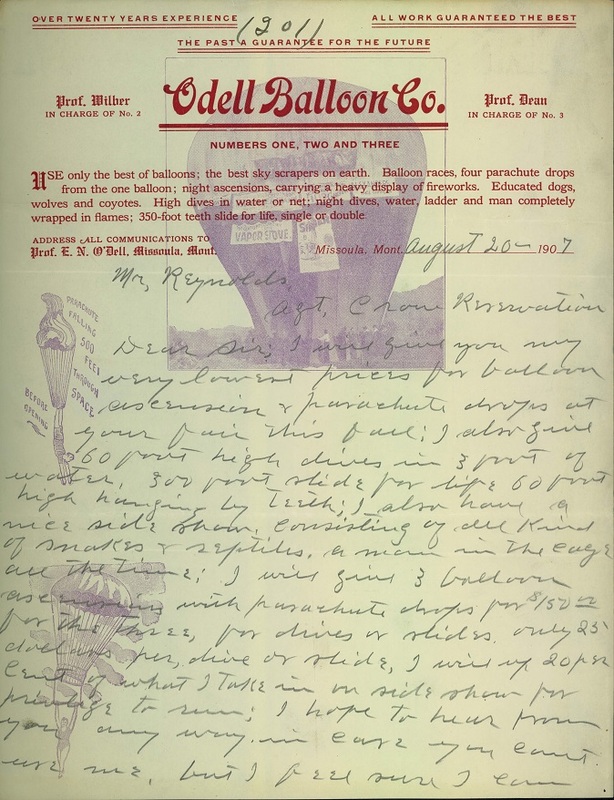 The Huntington acquired the exceptionally rare collection of telegrams in 2012, composed of a nearly complete archive of Thomas T. Eckert, the head of the military telegraph office of the War Department under Lincoln. The archive was thought to have been destroyed after the war and includes crucial correspondence that has never been published. Among the materials are 35 manuscript ledger books of telegrams sent and received by the War Department, including more than 100 communiques from Lincoln himself. Also included are top-secret cipher books revealing the complex coding system used to encrypt and decipher messages. The Confederate Army never cracked the Union Army’s code. But you can help by joining in at https://www.zooniverse.org/…/zoonive…/decoding-the-civil-war. They are looking for 75,000 volunteers. Through a grant from the NHPRC, the Center for Digital Initiatives at the Abraham Lincoln Presidential Library and Museum has published online of the Papers of Governor Richard Yates Sr., the Civil War governor of Illinois. Now they are looking for volunteers to help transcribe the documents at Chronicling Illinois, the Center’s online archive. The project includes the digitization of nearly 50,000 pages of documents, comprising nearly 15,000 documents from his four-year term. 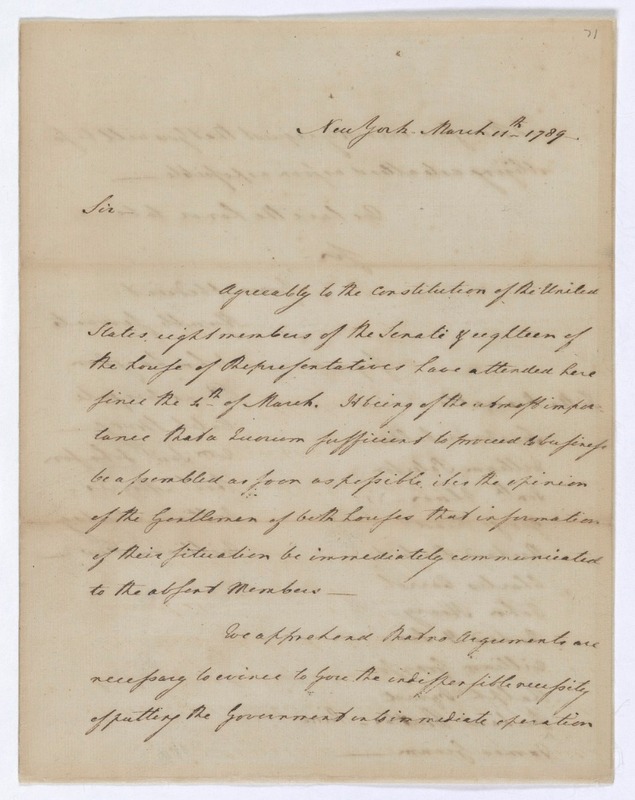 The documents come from the Yates Family Papers and from the Wabash Yates Papers at the Abraham Lincoln Presidential Library. Richard Yates (1815-1873) was one of the most consequential Union war governors. Known as the "Soldier's Friend," Yates worked tirelessly to ensure that Illinois recruit, organize, and supply troops. 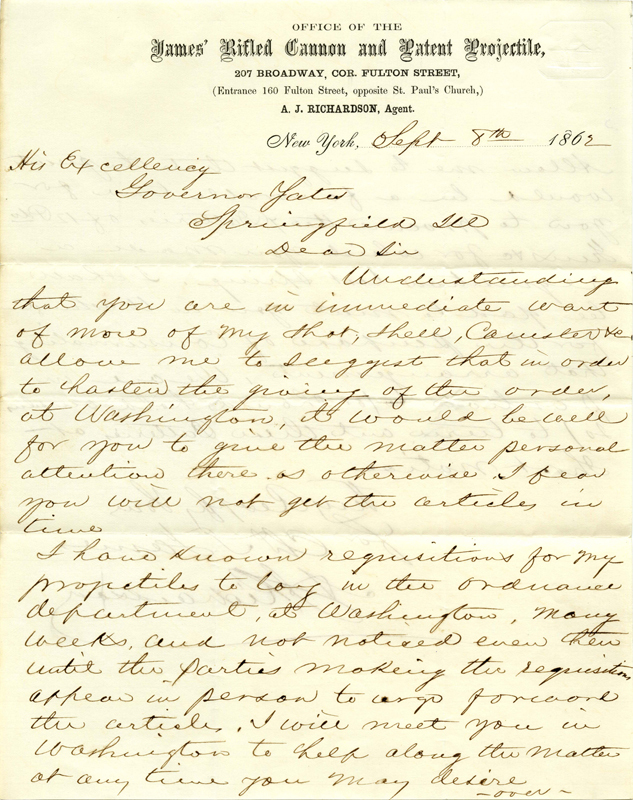 Thousands of people, both rich and poor, wrote to Yates about a myriad of subjects, including political campaigns, requests for jobs and favors, pleas to have sons released from military service and activity by Southern-sympathizing “Copperheads.” Among his more prominent correspondents were General Ulysses S. Grant, General William T. Sherman, Secretary of War Edwin M. Stanton, and, of course, President Abraham Lincoln. Want to help transcribe those documents? Go to Chronicling Illinois at http://alplm-cdi.com/chroniclingillinois/scripto. After creating an account, volunteers can transcribe handwritten documents through a simple interface or review the transcriptions of others to prepare them for online publication. Teachers can use the transcription process as a method of engaging students with primary source documents in a powerful way, while helping to improve the searchability of the archive through transcription.